Your portraits look like photographs ! Beautiful artwork! Thank you, Susan. Julae lived in Vina del Mar, Chile, not far from the vinyards, so it seemed fitting! WOW...This portrait is just fantastic! The vineyard makes it the perfect touch for the background. Marilyn, I can see why you are drawn to portraiture; this painting radiates such youthful vitality. Thanks for your feedback on Susan's Creek. Marilyn, this is absolutely gorgeous. What a beautiful portrait. I love the grapes. Was this a commission? No it wasn't a commission. Julae is our good friends' daughter, they are missionaries in Chile. I painted this in a workshop... there is an underpainting which is somewhat random... see the coloration on her arm... and I used the same colors of the underpainting to paint the portrait. However, I got three commissions from showing this painting! 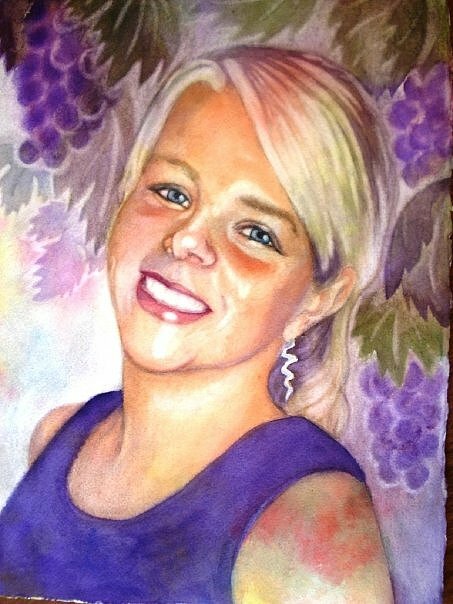 Julae was from Vina del Mar, Chile, so I painted her in a vinyard. She is such a lovely young woman.